213.562 kilometres per hour. At that speed you’re covering almost 60 metres per second, or more than the length of an average football field every two seconds. You’re also travelling at almost twice the legal speed limit in Australia. Now picture yourself averaging that previously mentioned 213.562 kilometres per hour for almost 340 kilometres, while battling with a racetrack that has taken the lives of almost 250 racers in the past hundred or so years. Just focusing on statistical data like this fails to do two things when you’re talking about the Isle of Man and its infamous road race however. It fails to give you the sensation of a motorcycle hurtling past you at close to 320 kilometres per hour with no safety barriers impeding your view. 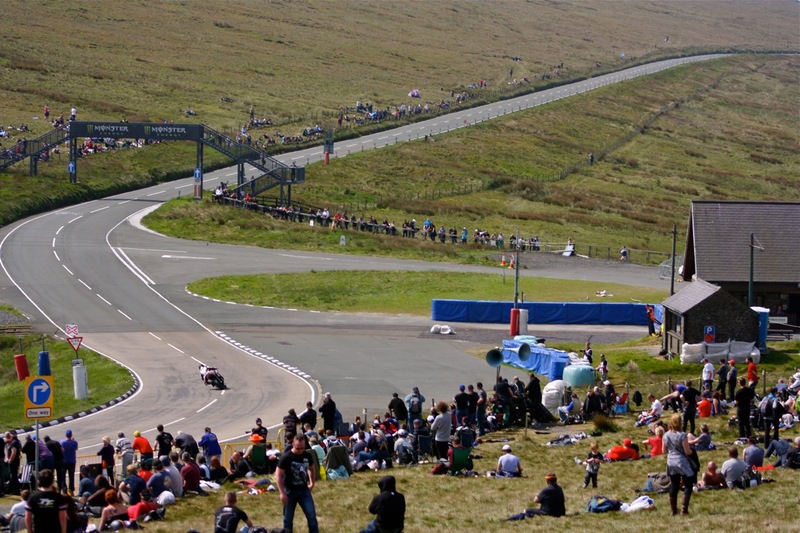 Furthermore, it fails to even come close to conveying the sheer scale and intricacies of the Snaefell Mountain Course that these Tourist Trophy races take place on. 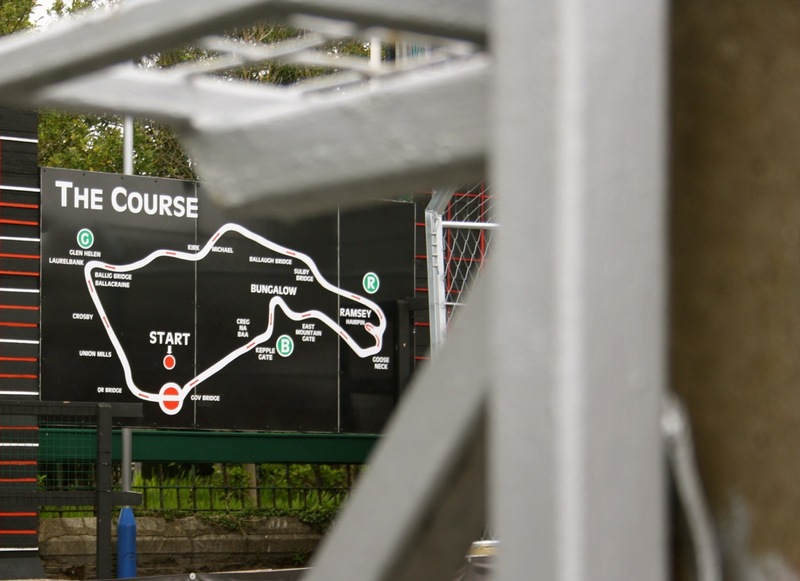 The Isle of Man Tourist Trophy, or TT as it’s affectionately known, has been running since 1911 with racers originally competing on the Isle’ due to the United Kingdom’s Motor Car Act. This Act placed a 32 kilometre per hour speed limit on all motorised vehicles and with much of the nation’s motorsport taking place on public roads, predictably enthusiasts were less than impressed. Being just a short boat ride from both Ireland and England, The Isle of Man became host to arguably the world’s most notorious motorcycle race. 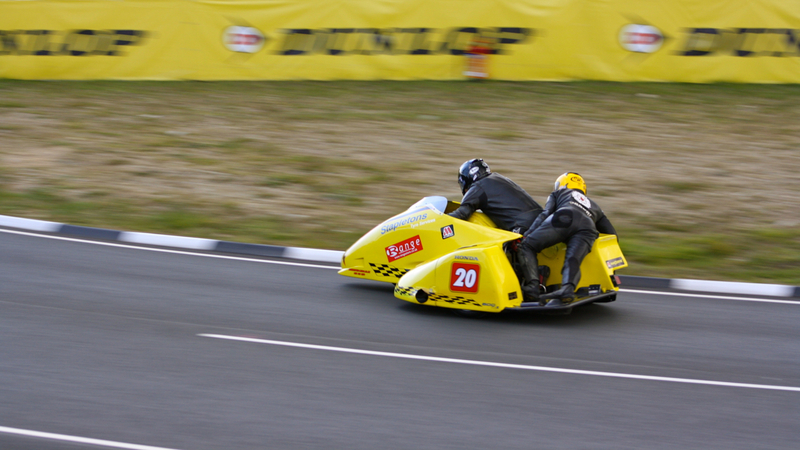 If you have an interest in motor sport then chances are you will have heard of the TT. If you’re a motorcycle enthusiast then chances are you would give your *insert name of significant other/body part* to witness, first hand, the lunacy that is the TT. After about 10 years of pining to visit the motorcycling Mecca, myself and two mates stumped up the cash and the three-weeks we would need to make the pilgrimage from Australia to what is essentially a tiny Island in the Irish Sea. Suffice to say, the 30+ hours of travel time was more than worth it when we finally witnessed the first competitors pass by just centimetres from where we sat. The TT takes place over two weeks with the first week set aside for practice and qualifying, while the second week – race week – sees everything from 600cc twin cylinder curiosities to 1000cc superbikes take on the mountain course. 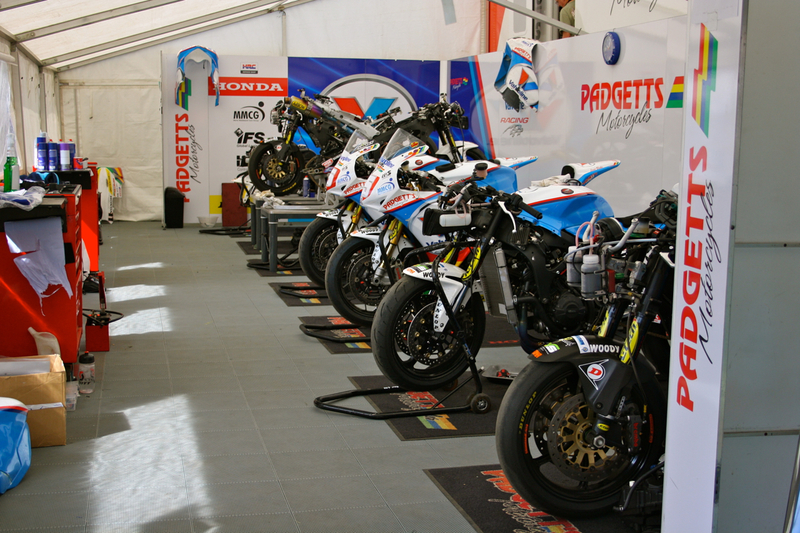 To take part in a full TT race week you need four bikes: A 600cc twin cylinder ‘lightweight’; a 600cc in-line four cylinder ‘supersport’; a 1000cc in-line four cylinder ‘superstock’; and finally the Full Monty 1000cc inline four cylinder ‘superbike’. To add to the already expansive line-up there’s also the 600cc side-cars to make you wonder if there’s anyone crazier than a sidecar passenger. Just to add to the complexity of this event, the TT Zero for electric bikes also features. Racing is scheduled to take place every second day, but a multitude of delays regularly play havoc with any schedule that may have been planned. Causes of this year’s delays included high winds on the mountain section (so high that they caused a fatal helicopter crash), literally hundreds of visitors seriously crashing, so many that the hospital was too full to accept any racers that happened to be unlucky enough to meet the rock walls that line the course. And here-in lies one of the craziest aspects of the TT. 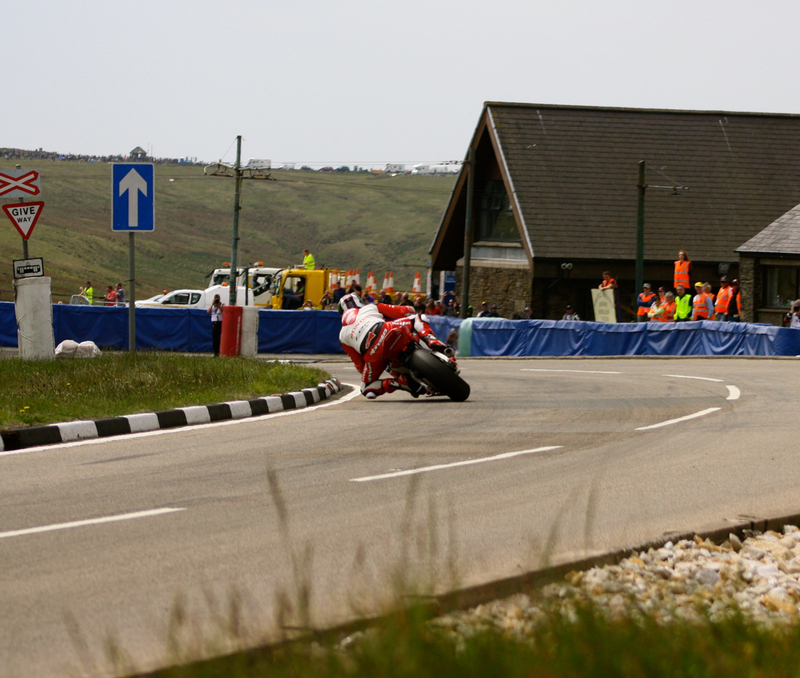 Any punter with a motorcycle (or car) can sample the Snaefell Mountain Course when racing isn’t taking place; and on the Isle of Man there are no speed limits except in its towns. This means that people watch massively talented riders take part in races held on a hugely challenging course and then think, ‘yeah, I can do that’. Many soon realise that they can’t. 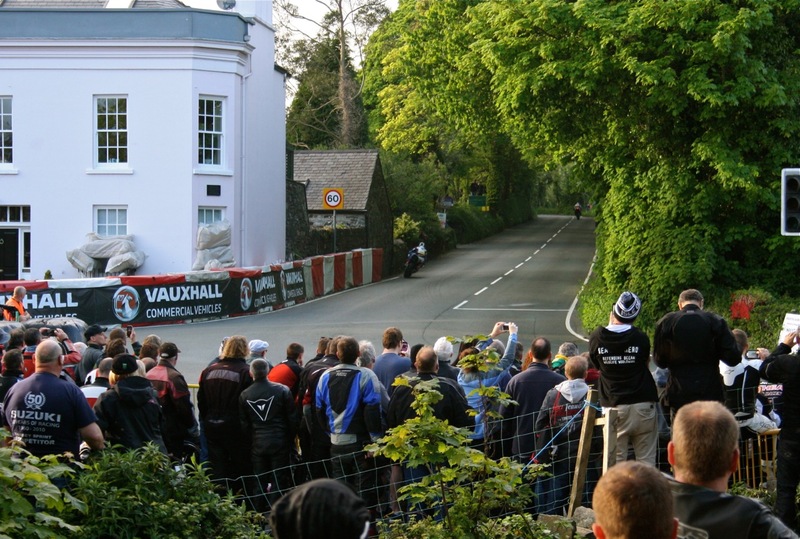 It’s not hard to see how these spectators get excited however and after speaking with people who had been to the TT every year since 1987, we confirmed that there really isn’t a bad place to watch the action take place. We realised the sheer scale of the course before we set off to the Isle’ and decided that we didn’t want to be ‘stuck’ in one area. Hiring a camper van allowed us to not only travel from place-to-place spectating, but it also meant that we could sleep where we parked (a plus when there’s seemingly more pubs than locals). The camper van also had the benefit of allowing is to sample the track first hand, albeit slightly slower than many others. 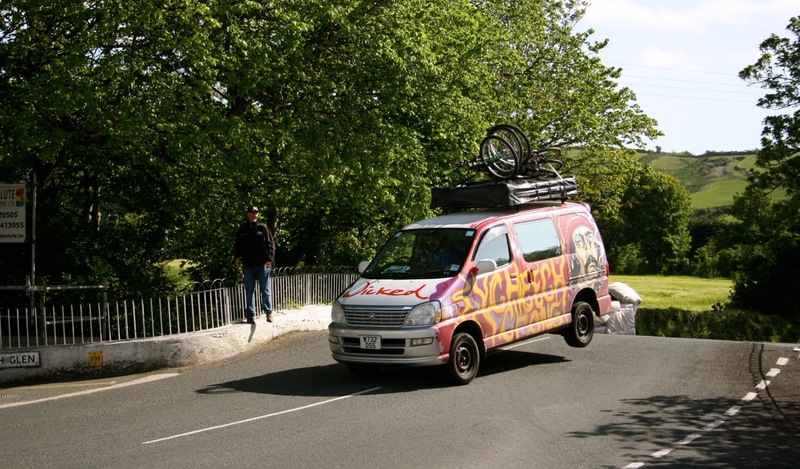 One thing that all of us ‘had to do’ was jump Ballaugh Bridge, just like the racers. As you can see below, we did the best we could with the tools we had available. But in all seriousness, there is nothing that can prepare you for just how close you can get to the action. Most sections, while controlled by marshals, allow you to essentially sit in the ‘gutter’ while a motorcycle with as much power as a British Superbike hurtles towards you at speeds of almost 320 kilometres per hour. The racing we were luck enough to witness was world class and the overall lap record and highest average speed was again toppled this year by TT legend John McGuiness. 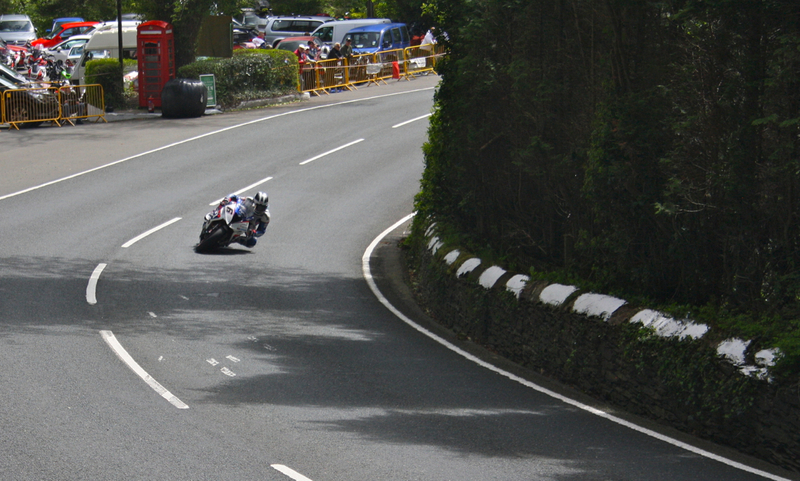 Lap times aren’t as heavily publicised in the TT’s results as the race is more about highest average speed, but just for context, McGuiness’ fastest lap meant that he covered over 60 kilometres of the world’s toughest ‘racetrack’ in a bit over 17 minutes. The most impressive thing about watching McGuiness race was not only how smooth he was, but how he consistently used the same line and hit the same point of the corner’s apex every lap. After 340 kilometres of hard racing he looked just as smooth, controlled and fast as he did at the beginning. Something you don’t get to witness from a grandstand or on the TV. One of the biggest surprises was just how good the side-cars were to watch. These racers don’t get the recognition they deserve for simply completing a lap at the TT, let alone averaging just 25 kilometres per hour slower than the fastest superbike. These three-wheel death traps buck, weave and generally carry-on in a way that would scare even the hardest racer away from them on a closed course, let alone a race on the Isle’. Just like focussing on the statistics of the Isle of Man Tourist Trophy doesn’t do it justice, nothing I write can truly relay the scale, the passion, the danger or the prodigous nature of this race or the Snaefell Mountain Course it takes place on. While many who haven’t been insist that the TT’s day’s are numbered, it’s part of the Isle’s culture, their history and their livelihood. Many have died and many will continue to-do-so, but whether you talk to a competitor or a spectator they all know the risks but they love it anyway; and rightly so.